Despite the racing being out at Eton Dorney – 20 miles from home – we were quite fortunate that our heat wasn’t until 11am, and as I was driving that meant an alarm call of 7 as usual! The drive to Dorney was pretty quick, however as we got towards the lake the sat nav decided it knew better and tried to take us off down someone’s driveway! As a result, we ended up slightly lost in Eton, in amongst some rather magnificent buildings! Once we found out exactly where we were meant to head to – the Mets’ website did warn that sat navs don’t like the area! – it only took a couple of minutes to get there, and we soon got parked up. What we didn’t realise was that we were parked halfway along one side of the lake, and the boats were on the opposite side – what looked so close actually took ages to walk! Boat rigging took barely any time, and we soon had the Noel ready to race. We had a crew chat with our cox Marie – she ran us through the race plan so that we knew what to expect, and soon after it was hands on. Once again, forgetting how far the boat was from the start of the lake we set off carrying the Noel down to the pontoons. About a hundred metres down, the real weight of the boat hit us! 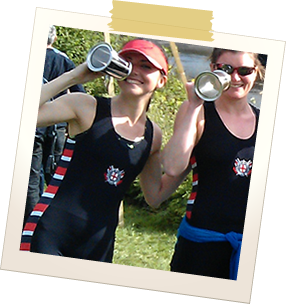 We only ever carry it from the boathouse down the embankment – 100m at most! Whilst it feels a little more glamorous standing on a pontoon to put the boat into the water, there’s something a little unnerving about the fact its floating, and one wrong move and you – or worse, the whole crew! – could slip and go in with the boat! Anyway, we got the boat in the water, pushed off and headed down the warm up lake – hidden behind the bank – to make our way to the start. We worked through the usual warm-up of hands, hands and bodies, and working our way up the slide. We then had a couple of racing starts in an attempt to burn off a little adrenalin. The marshall called the boats from our heat to get into order, and directed us down and through the bridge to get into position. We were lane 6, therefore second from last to pull through onto the lake, and got ourselves into position as quickly as we could. Unlike the regattas we had entered prior to this, the start was much more formal – we were given a countdown to the race start from the official in the box, and once all boats were docked at the start the official called attention, then a short pause before the digital boards on shore lit up green and beeped to signal the start. Unfortunately, the official called the start whilst Marie still had her hand raised, as we were still tapping the boat straight, and so we were all a little caught out. Our start wasn’t awful, but we weren’t getting much power down, and there wasn’t the rhythm in the boat, which made the race a battle. In terms of pacing, we were told to go all-out in the first 250-500 to get a good start, then lengthen and pace it out, before pushing again for the 1500m mark, and again for the last 250m. Without the rhythm it was hard getting the power down, not only this but there were too many blades not catching properly and so Marie had the boat on full steer to bow-side for the whole race as bow-side were pulling the boat over to the lane to our left. Consequently steering adjustments have an effect on both balance and speed, and in an ideal world over the length of a straight-lane there should be very little steering required. Despite feeling like forever to get to the mid-way mark, the race was much quicker than I had feared, and we finished the race 6th out of 7. Obviously gutted as a crew not to have got through to the next round, or repechage, however it was a great experience – racing on a lake against 6 other boats was very exciting and new to us all. Once we got the boat back on trestles, we were then left to chill out for the rest of the day, whilst the rest of the crews had their races, and so we sat by the finish line to have lunch and cheer on TRC crews. My parents had made the journey to Eton Dorney to watch us race – I spotted my mum, busy with her camera taking photos of us all as we were getting in to the water! – and so they joined us to sit and watch. It was nice to be able to spend some time with them whilst watching the racing. Training has taken over everything recently, and has meant that I am unable to go home to see the family like I used to, and so the only opportunity I get is if they happen to come into London – so it was nice to see my dad again for the first time in 6 months! And I get to do it all again tomorrow, with the other 8 that I’m racing in this weekend!